New cashmere styles from Autumn Cashmere, Vince and Joie! It’s sweater weather in North Carolina! And you are in luck–we just received new cashmere sweater styles from Autumn Cashmere, Joie and Vince! Autumn Cashmere is a brand that’s been around for a bit, but we’re now carrying them at Uniquities! We strive to bring you the best products–and cashmere is something so special that we only want to bring in the best. More styles in Chapel Hill, Cameron Village and North Hills. Joie is a label we love! Check out the anchor crewneck that made its way through the blogosphere earlier this month. Now in Chapel Hill and Cameron Village. 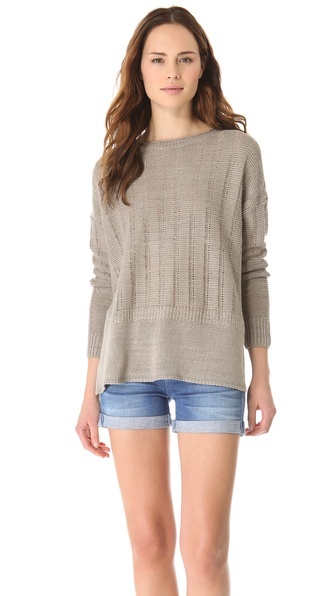 We are in love with a crewneck pullover for Spring! One of our buyers saw this on the rack at a show and knew we had to have it! Citron is a color we’ll be seeing a lot during Spring 13, so why not get in on the trend now! The color and weight are perfect for year-round wear. How cute is this sweater with denim!? Want the latest updates on new arrivals and other Uniquities news? Follow us on Twitter and Instagram!